The building you see above is a former shopping mall called "Marketplace Mall". It's location is in Bowie, MD. which is a rather busy city in the DC Metro Area. It once housed many businesses and many places to eat and spots for all to enjoy. 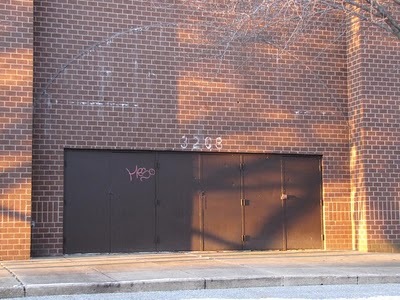 being a child of the 80s and 90s, I spent a lot of time here when it was in full effect. There wasn't one vacant spot when it was at it's peak and the mall was usually full of people. But it seemed that the mid 90s was the final chapter for this long standing mall, a mall that had been serving the Bowie area for a little over 30 years(you'll have to excuse my lack of knowledge on it's exact dates) until Bowie Town Center moved in put Marketplace into submission. 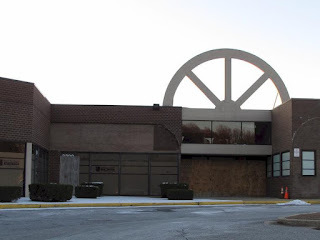 While I don't have exact information or even a lot of photos of this mall when it was thriving, I do have photos of it's current state from a great website called which you can visit at Bowie Living(photos credited to Bowie Living.). And with those photos I wish to tell a story, share my memories and let you know why this mall meant so much to me. While I can't paint a perfect picture of the mall, I'm going to try. The mall had a lot of stuff for a young kid to do. A video store, a dollar store, a comic store, a pizza place, a movie theater, an arcade, and a fun playplace called "Sportsland" where I had my 11th birthday. All these components made a perfect place for me to be as a kid. I had such a variety of spots to hit while my mother, who would take me there almost every other weekend to get her hair done amongst other things, shopped around. Yep. It was perfection. Now, it's size lent it a bad hand. Compared to the Annapolis Mall, this was a shopping plaza. And much like any other shopping mall, stores came and went, but the impact on me lasted forever. Perhaps the longest lasting memory I have is within it's movie theater. While other movie theaters populated the area, this one will always hold a special place in my life. For my 4th birthday, my father took me(as a surprise) to see the big screen debut of my childhood hero, He-Man in "Masters of the Universe: The Motion Picture". When I finally realized what was happening, I was floating on air. I got to see my favorite cartoon hero with my real life hero on the big screen for my birthday. What more could I ask for? It was terrific! 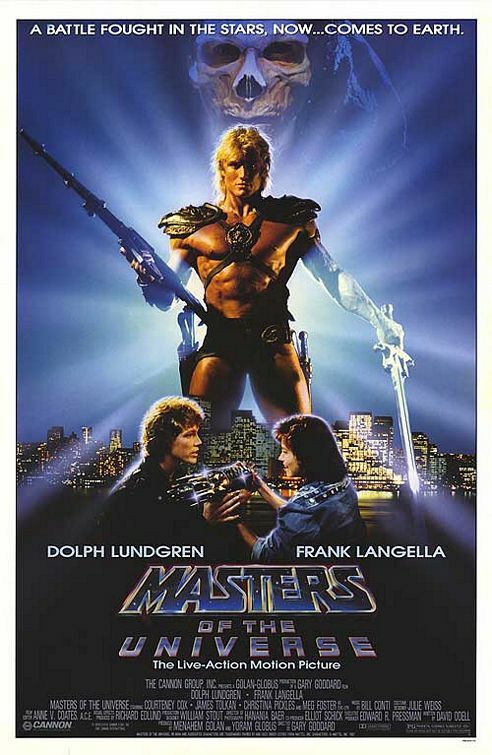 I got super wrapped up into the movie that I even began cheering for He-Man very loudly and most likely annoyed the older crowd in the theater. After the film, I came out of the theater bouncing as floating on air. This proved to be one of my earliest memories of my life and a very important point in my life as my father would pass away two years later. I'll forever hold this moment, movie and birthday in my heart. I'd see many movies after this, but none as important. The movie theatre would shut down completely in 1999. You can see the remnants of the old comic store and karate place. Years later, I'd heavily fall into the comic book game and fandom. Collecting comics was a big hobby and a very profitable. And of course, many comic stores popped up to accommodate the growing interest of the big comic boom of the late 80s to late 90s. Outside of the mall was a comic store that also dealt in sports collectibles. I remember the owners very vividly being a couple of naive, rude hillbillies. The comic store was a fun spot to hit, especially when new issues would come out every week. And while the owners were not too kind to deal with, the stock and variety was worth it. Trading cards, action figures, sports memorabilia and many other things peppered the store. In 1998, things went from fun to horrible. The hillbilly couple that owned the store, seemed to devote the entire store to nothing but Beanie Babies. The normal stock remained, but they refused to order anything else but those obnoxious Beanie Babies. However, this was the point in time when Beanie Babies ran the country and everyone was going insane over them. Why? Who knows. Eventually, within a few months, they drowned in their stock of the stupid novelty plush toys and went out of business. A sad end to a really cool store. Sportsland was another tenant that I hold to a high degree. Sportsland opened in the mid 90s, I want to say maybe 1993 or 1994. It was a real fun place that resembled a family-fun center that had go-carts, arcades, a ball pit, a rock climbing wall and lazer tag. My fondest memory here is both my 11th birthday and my friend Ryan's birthday. My friend Ryan's birthday was spent here and I was the star, ironically. We had a game of lazer tag which involved about 10 people. In the lazer tag arena, there were barrels sprawled across the room. I decided that I wished to become to the MVP of the game(they'd give you a spreadsheet listing who was the best, worst and so on), so long story short, I got stuck in a barrel and it took them a good twenty minutes to get me out. It may not be the most proud moment of my life, but Ryan and I still get a laugh out of it to this day. There were other stores, as I had mentioned. A Ben Franklin Craft store was at one corner, while a Peebles and CVS at other points. A Mr. Chicken dealt out friend chicken like you wouldn't believe, while a small time pizza place right across the movie theatre whipped up a perfect slice of you-know-what in no time. A Music and Arts store, which dealt with musical instrument rentals was also a very familiar spot for me, only because i could never make up my mind on what I wanted to preform in school. I used to take lessons in the store's rehearsal spaces. 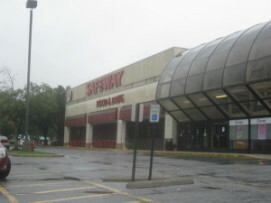 The Safeway, which is the only remaining store, anchored and has always been a big part of the mall. But, Safeway now looks like a senior in high school that got held back about 5 times: very awkward and sticking out like a sore thumb. The final tenant of a once great mall. Around 1999 or 2000, most of the tenants were simply memories fading away. The movie theatre was gone thanks to a movie theatre up the road with a much more advanced setup, stadium seats, technology and many more theaters. The stores slowly exited as well. More and more tenants slowly left. By 2001, it was all over for Marketplace. Just miles away, a new "Bowie Town Center" opened. An open air shopping center with the most stylish and popular stores that make any of the stores remaining in Marketplace look like a mere flea market. by now, many residents were wondering how and when the mall would have it's plug pulled. This mall went from a fun place to go to a dead mall that quickly needed a mercy killing. And it seems that a lot of crime and young kids have gotten into the mall to deface it with graffiti amongst other things. Most of the doors and windows have been boarded and bolted. The exit from the movie theater. In the past few years, many theories have come out on how to renovate or replace the shallow and dark shell of Marketplace. Finally, it's been announced that Marketplace will be demolished this coming summer and will eventually be replaced with a new shopping center. Now call me stubborn or stuck in my ways or whatever, but no matter what is going to replace Marketplace in it's absence, it won't be the same. I won't be able to share the same moments and memories that I once held in this former shopping mall, but I'd rather have "loved and lost than never have loved at all". And that sums up my feelings and my love for this former mall. I guess I speak for anyone who spent time in Marketplace by saying that when it goes down, it will be for the best. It's best that something new goes up than just staring at an old reminder of better times, I suppose. Thank you for writing this. I drove by the mall this past week with my much younger sister and ended up telling her everything I could remember about the place, which wasn't much so it was nice to see what someone else remembered. Just like you, I have very fond memories of seeing movies at the theater with my dad and afterward he would treat me to a slice of pizza. I hadn't heard about the demolition yet and I'll be sad to see the mall go, but hopefully something better will be built in its place. Thank you for reading and sharing memories Courtney! By any chance,d o you remember the name of the pizza place? Also, last I heard demolition will commence by June or July. I havent been in Maryland since April, so I don't know current status. Dude, thank you for posting this! I grew up in that area too and remembered the mall , but could never find details on it. I've been trying to research it to write, so I'm super grateful to have some neat background on it! The pizza place was Angelinea!! And never forget about Happy Italian at Free State Mall. Great blog post. I really wish you had some pictures of the mall up and running. Ya know, being up in Rochester, it's hard to keep up with the latest news on Marketplace. But I hear the Safeway finally shut down in September. Thank you all for your comments, and yes, I had photos of the mall in it's prime. I'm sure someone,somewhere, somehow has photos...I'd love at least ONE photo of the theatre at least. Although, I feel like I have a crystal clear photographic memory of that theatre. I wish more info was available as to what stores or a directory or something. But, like I said, the mall's layout and it's smaller size gives an easy advantage in remembering what was where and what stores were thriving. Anyone remember that book store next to Mr. Chicken? Also, is it just me or did Angelina's ALWAYS have a sporting event, a boxing match, or something like that going on? lol! I'm kind of considering doing a Freestate Mall writeup. It was still a big part of my life, but not as big. Anyone have any info on Freestate through the 80s to it's closure in 03? Auggie Doggie, no I don't remember, sadly! What spot was that in the mall? I believe the bookstore by Mr. Chicken was Crown Books, which later relocated to Hilltop for a time before large chains like Borders and Barnes and Noble rendered the store obsolete in comparison. It is really a shame they couldn't just revitalize the place and add some relevant stores to keep it going. It will be interesting to see what happens but it would be cool if they brought the theatre back and showed old school movies. So much potential to make Bowie stand out, I hope someone has a creative vision instead of more bland architecture and crappy stores no one needs. Caitlin, YES! I remember Crown Books!!! I tend to remember my father buying me a few books there as a kid and for some reason, the price tag logo sticks out! I feel your pain my friend. I to have watched so many of my old stomping grounds, places of fond memories that created and built inside me my love affair with cinema, comic shops and so on, slowly fall apart and now no-longer exist. I can count 3 malls that no-longer are reality these three malls where my childhood. I remember countless birthdays at these malls watching movie after movie. I attended more then 12 Horror movie Marathons at these places. I trick or treated in the Malls. I remember standing in line for Return of the Jedi. It's truly sad when our past slowly falls away and disappears, but as long as we have the memories, that is golden. I stumbled across this looking for pics of the arcade that was in the mall. I spent most of time in 87 and 88 in that arcade. Still cant find any images though. Thanks for the post and memories! And if I may, a couple of memories. My buddy Pete working in the key cutting kiosk, and my buddy Morty working in the Music store. Also renting "My Bloody Birthday" from the video rental store just a week after we saw it in the theater there in the same mall! I will miss this mall very much. Great blog about what you remember about Marketplace, thanks for getting it out there. The memory of your dad taking you to He-Man is wonderful. I was an usher at the movie theater when I was in high school, '86 and '87. I have great memories of that theater and mall. I believe the Angelina's was called Three Brothers Pizza before it was Angelina's, and now that I know that Angelina's reopened in Edgewater I'll be stopping by this weekend! I am currently researching the theater (and by consequence the mall) by going through old Bowie Blade newspapers. I'm mainly trying to create a timeline, who was in there and when, and when they left and what replaced them. But a strong focus on the theater. So the mall was owned by a guy named Zeigler who lived in Florida and was rich through commercial property ownership. He only ever came to Marketplace like once a year. He was a true "absent landlord" and I don't think he cared about the mall. He had a private briefing box in theater #5 (the largest auditorium of the 6) and we employees used to put a ladder up to the outside of it and get up in it. It was small but had a couch and recliner in there. The projectionist would run a movie after we closed up. Good times. I took photos of the old marquee (that we used to change the letters by hand) before it was torn down. I think I have some other mall exterior shots too. Hopefully I'll find a forum to put up my research on it when I finish. Thanks again for the blog article! I have a dispute going with a friend of mine. He does not remember it being a Three Brothers before Angelinas. Do you have any pictures or Bowie Blade articles that show proof that it was a Three Brothers? It would be helpful to settle a bet. Great post. I could go on forever about the time I spent at this mall in the early 90s. Does anyone remember the name of the video rental place? I spent hours and hours in there. Many fond memories of eating cheeseteaks with my dad at Augie Doggie's and perusing the comic store for Pokemon cards. What was the name of that place? All Star Cards?